I came across this recipe somehow, when I was looking at one of my favorite blogs, The Way the Cookie Crumbles. I kept it in the back of my mind for a night that would require a fast dinner. We enjoyed this when my sister was here visiting with her kids. I threw it together after a long day of swimming and playing and all the kids were really happy about eating it. I didn't get a great picture, but once again, with that many hungry mouths to feed it makes doing so very difficult. I don't use frozen peas very often, but they went really well with the soba noodles in this dish. 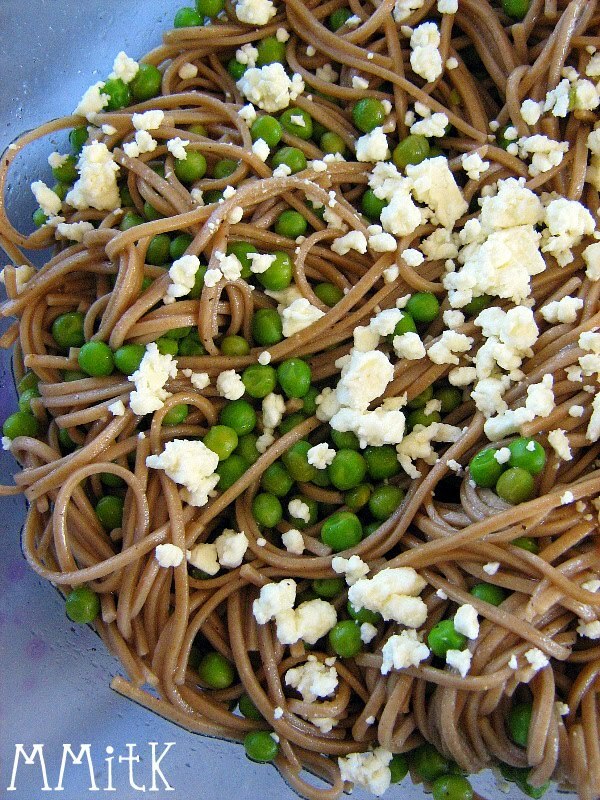 The soba noodles are dressed with a simple lemon juice & olive oil mixture, that also contains a dash of soy sauce. It makes for a great combination. The best thing about this recipe was how quickly it came together and at the same time, it was very flavorful and delicious. I went to random.org to find a winner for my fig giveaway and the winner is #6- Rachel, who said "I would love a bunch of fresh figs, I love anything with fig but I've actually never had fresh ones - I love the way they look inside! =)". I hope she enjoys her fresh figs! Now onto today's recipe, which is something I threw together a couple of weeks ago. We eat roasted shrimp at least once a week and this was one of the version's that I made recently. I thought it would taste great with some orzo and roasted vegetables. I also added some fresh corn kernels since summer is winding down a little bit, I thought I would get some fresh corn in while I can. This was a really delicious dinner. Sorry the instructions are a little crazy, but I just tried to record what I did, since I just made this one up. I make up dinners all the time, but usually don't post them. This one was just too good to pass up. First, get your water boiling for your orzo (I used half a box). Prepare that according to the package directions. Then roast your vegetables- I used asparagus and red bell pepper this time. Set them aside while you prep the other parts of the salad. Turn down the oven temperature and roast your shrimp. While the shrimp is roasting, cut your corn off the cob. By this time the orzo should be ready, drain the orzo and put it in a large bowl. 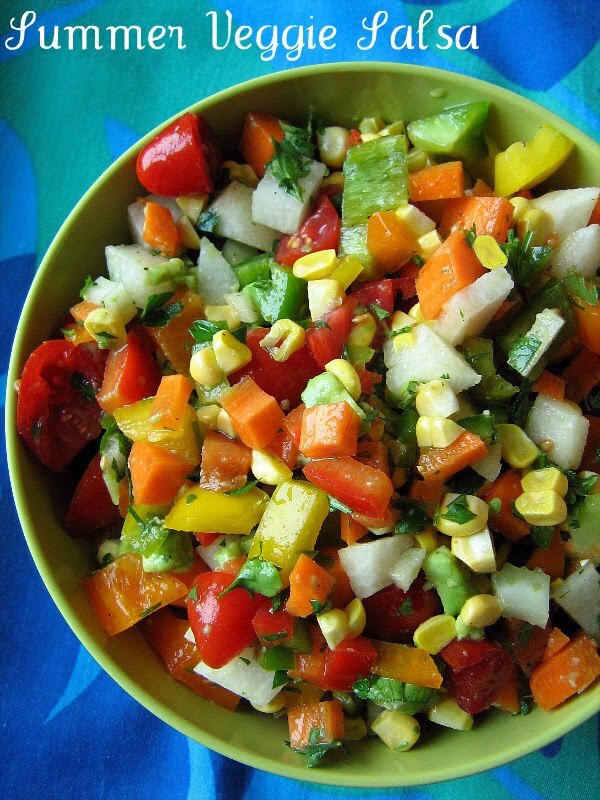 Add the roasted vegetables and corn kernels. Then add about 1 Tbls olive oil, the lime juice, 1 Tbls red wine vinegar and chopped parsley. Season with salt and pepper. Add more olive oil, vinegar or lime juice, to taste. 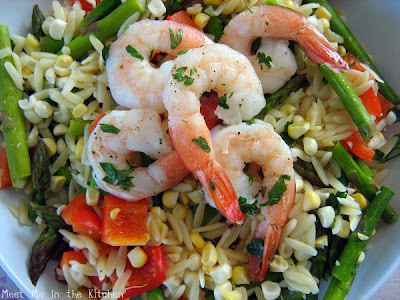 Serve in bowls and top with roasted shrimp. Preheat oven to 425 degrees F. Chop vegetables into 1-inch pieces and place on a rimmed baking sheet. Drizzle with olive oil and season with salt and pepper. Roast in oven for 12-15 minutes or until veggies are crisp- tender. Preheat the oven to 400 degrees F. Place the thawed shrimp on a large, rimmed baking sheet. Drizzle with olive oil, the lime juice, and season with salt & pepper. Sprinkle chopped parsley on top and toss everything together with your fingers. Roast for 8-10 minutes, until shrimp is pink and firm. A couple of weeks ago I was contacted by Cristina, who asked me if I was interested in receiving a shipment of figs from the California Fig Advisory Board. I thought it was very interesting that she contacted me just 1 day after my father-in-law left some fresh figs from his backyard at my house and the same day that I had used some of them in this delicious Oatmeal Breakfast Bread. That was my first experience baking with fresh figs. I jumped at the chance to receive more figs and was excited when they arrived in the mail last week. I had spotted a recipe for Fresh Fig Ice Cream in David Lebovitz's The Perfect Scoop and that was the first thing on my list to make with my figs. It couldn't have been easier to make either. I just cut up some figs, put them in a saucepan with a little water, let them get tender, added a little sugar, then let the mixture become soft and jam-like. 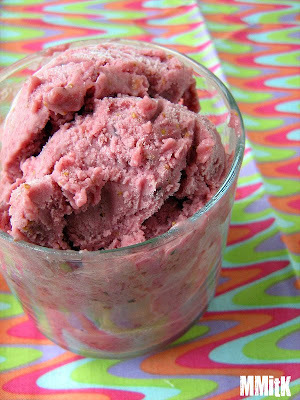 Then you let the fig mixture cool a little bit, put it in the food processor with a little cream and lemon juice, puree and the only thing left to do is let it cool and churn it in your ice cream maker. Because figs have such a beautiful color and flavor, this ice cream is unbelievably delicious. I think it is my new favorite. 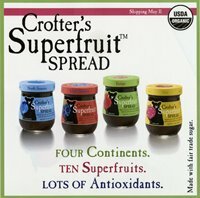 We have been eating them fresh, adding them to salads, pairing them with a little cheese and enjoying them quite a bit. I even received some dried figs, which I can't wait to use. I have been given the chance to giveaway a case of fresh figs! If you are interested just leave a comment on this post, making sure to leave a way for me to contact you. This giveaway will close on Saturday, August 28th at 12 am, midnight. Here are some interesting "Fig Facts". 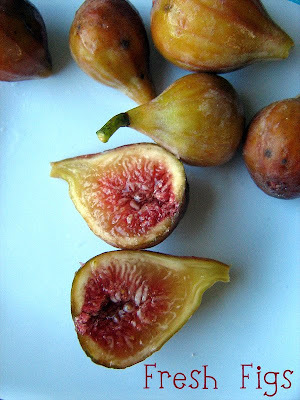 · There are five varieties of California figs; each with distinct flavor profiles. · The fig tree is the symbol of abundance, fertility, and sweetness. 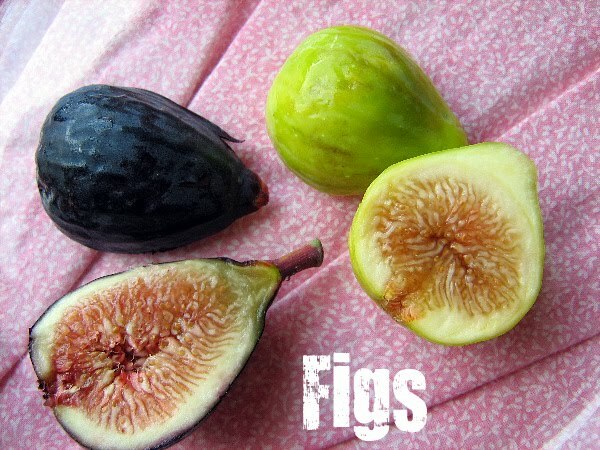 · Figs provide more fiber than any other common fruit or vegetable. · Although considered a fruit, the fig is actually a flower that is inverted into itself. 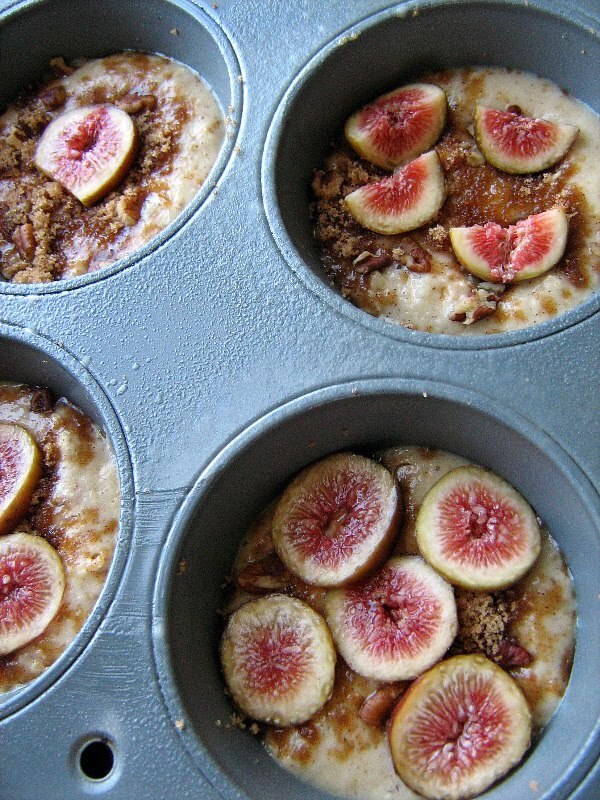 · Figs contain natural humectants – properties that extend freshness and moistness in baked products. · Figs are fat-, sodium- and cholesterol-free. 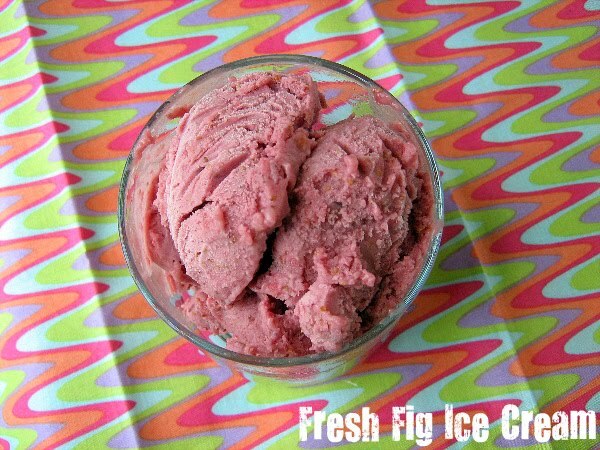 · California fig growers produce 100 percent of the nation’s dried figs and 98 percent of the country’s fresh figs. To learn more about California fresh and dried figs, visit www.calfreshfigs.com or www.californiafigs.com. Remove the hard stem ends from the figs, then cut each fig into 8 pieces. Put the figs in a medium, nonreactive suacepan with the water, and zest the lemon directly into the saucepan. Cover and cook over medium heat, stirring occasionally, for about 8-1o minutes until the figs are tender. Remove the lid, add the sugar and continue to cook until it reaches a jam-like consistency. Remove from the heat and let cool to room temperature. Blend together with cream and lemon juice, chill in the fridge and then put in your ice cream maker per the manufacturer's instructions. 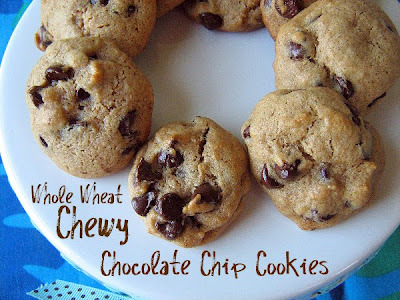 I have been wanting to try this recipe for Whole Wheat Chewy Chocolate Chip cookies ever since I went to the King Arthur Flour Baking Demonstration quite a few months ago. This recipe was included in the booklet they handed out after the demonstration. I wanted to try it because it only uses whole wheat and because it is for a chewy cookie, which I prefer over other textures when it comes to cookies. We had some new neighbors move in a couple weeks ago and I thought it would be the perfect time to bake the cookies and share them. Plus, my neighbor had already told me that she had a wheat grinder and made her own bread, so I had a feeling her family would appreciate the whole wheat-y "ness" of these cookies. I read the recipe ahead of time, so I knew to mix the dough up the night before. It made it really easy to just take out the dough and bake up the cookies the next day. My neighbors loved these! We really liked them too. Of course you can taste the whole wheat, but we all liked it that way. Give them a try! Stir in the vanilla, salt, baking soda, baking powder, corn syrup and vinegar. Add the eggs, beating well after each. Add flour, stirring to combine, and then mix in the chips. Cover dough and chill overnight. Line 2 baking sheets with parchment or Silpat. Drop the dough be rounded tablespoonfuls onto the prepared baking sheets. Bake the cookies (reversing the pans midway through, top to bottom, bottom to top…if you are baking more than one sheet at a time) until they are just beginning to brown around the edges, 12 to 13 minutes. Remove from oven and allow to cool completely on the pan. Muffins are one of my favorite breakfast treats. I like that they aren't overly sweet. They are quick and can be healthy. Fruit is easy to include in them and they are just simple. I had some extra raspberries in the fridge leftover from some other adventure that looked like they wanted to be included in a muffin. I searched online for a recipe and found one that looked good over at Eating Well. I liked that it used buttermilk and not too much sugar. 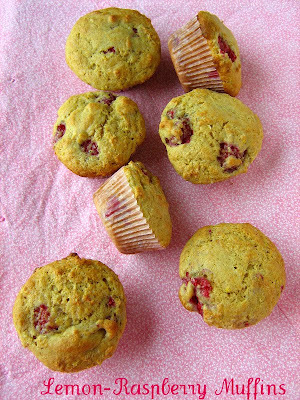 The lemon flavor really played well with the raspberries in these muffins and the texture was perfect. My sister was here visiting this past week and we were able to share some dinners together. We both love eggplant, so I saved these recipes that I had spotted a couple of weeks earlier, for her visit. Preparing dinner for starving children doesn't provide the best opportunity for taking photos, so excuse the bad picture of this one. Don't let it stop you from trying this recipe. 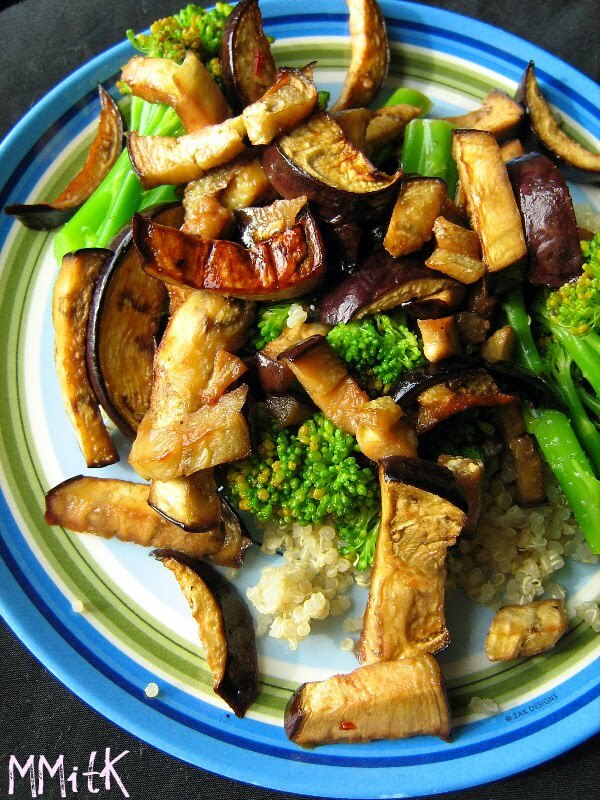 This particular night, we had this delicious eggplant salad over quinoa and steamed broccoli and cauliflower on the side. We had 6 hungry kids between the 2 of us and everyone enjoyed this yummy salad. 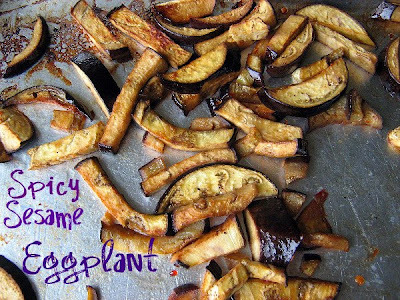 Eggplant is one of my favorite things to roast in the oven. It takes on whatever flavor you want it too and it becomes brown, crunchy on the edges and melt-in-your-mouth smooth, all at the same time. There were three salad variations that went along with the basic roasted eggplant and this time we went with the chickpea & feta version. I threw in some halved cherry tomatoes because tomatoes go well with the other ingredients and then I snipped some fresh herbs from outside my front door and added them to the mix. I don't usually get posts up this quick, but somehow I did with this one. We had this salad for dinner a couple of days ago and it was really good. The salad caught my eye in a recent issue of Vegetarian Times. It looked too delicious to pass up and seemed like the perfect summer meal. First you crisp up some lightly seasoned corn tortilla strips in the oven. While that is happening you mix up a quick, light dressing. The dressing starts with warming some olive oil, garlic and spices, which is then combined in the food processor with lime juice, scallions, and cilantro. The dressing was really good! Then all sorts of veggies are chopped and added to a bunch of romaine. You've got celery, tomatoes, avocado, cucumber, fresh corn kernels, roasted red peppers and really, whatever else you want to add. I decided to add sliced mushrooms since my family likes them. Oh, and don't forget the pinto beans, for some protein. My son doesn't like dressing on his salad, but this time I decided to go ahead and dress the entire salad before serving it to my family. I gave everyone a large bowl of salad and we all dug in. The kids really liked this salad, even my son- with the dressing. I loved it too. It was really fresh and delicious. 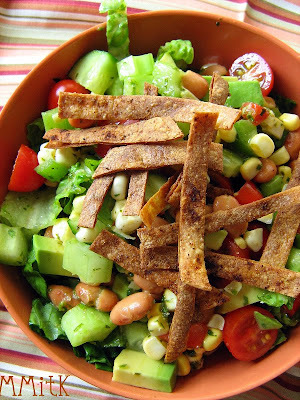 The tortilla strips gave just the right amount of crunch and the dressing was the perfect compliment for all the veggies. I had the leftovers for lunch today. Wish there was more for tomorrow! Natalie of Oven Love chose today's TWD recipe, Oatmeal Breakfast Bread. You can find the recipe on her blog HERE. My father-in-law left a large bag of fresh figs on my doorstep one day, that he had picked from the fig tree in his backyard. I have never had fresh figs (they are so delicious), so I decided to let them play a part in this breakfast bread. I like muffins better than loaves, so I halved the recipe and made jumbo muffins. I got 6 muffins out of a half recipe. I sliced some fresh figs, quartered some, and halved others- out of curiosity, to see which method would work better with the brown sugar-nut topping. The halved figs sunk into the muffins, while the slices and quarters stayed on top, getting sticky and soft. I left out the chopped, dried fruit that was supposed to be mixed into the batter because I used the figs. 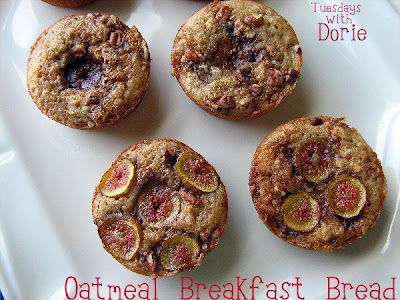 These oatmeal muffins were really delicious. Especially with the figs on top. See what all the other TWD-er's thought about this breakfast bread by checking out their links HERE! And don't forget to enter my giveaway, which is open until Thursday at midnight! 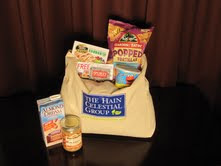 Giveaway-Hain Celestial Products, such as Granola Bars, Nut Butter, Tortilla Chips, and More! This time I was able to sample products from Hain Celestial and they are going to give a prize pack to one lucky reader. All you have to do is leave a comment on this post. Please make sure you leave a way for me to contact you in your comment. This giveaway will be open until Thursday, August 19th, at 12 midnight. The prize pack, valued at $50, includes a variety of the latest all-natural and organic foods and beverages from Hain Celestial including items from Garden of Eatin® tortilla chips, Almond Dream® non-dairy beverages, Health Valley® granola bars, Maranatha® nut butters and Earth’s Best® snacks and frozen foods. The Hain Celestial Group, Inc. has created the “Family Fitness Fun Challenge”. 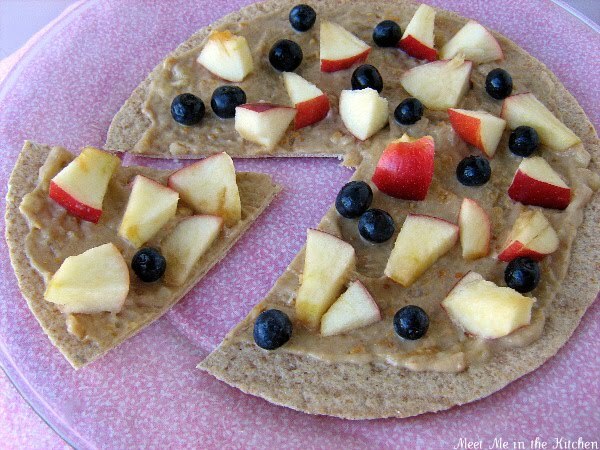 Located at www.TakeaHealthyBite.com, the program invites families to eat right and exercise together for a chance to receive high value coupons for Hain Celestial products. Additionally, families can receive free Sports Authority® Gift Cards for use in purchasing items like sporting equipment and athletic gear that will enable them to get fit as a family. On the site, families can access activity, meal and snack ideas, log total hours spent participating in fitness activities to receive product coupons and download a form to mail in register receipts. Receipts totaling $10 in participating Hain Celestial products for a free $5 Sports Authority® gift card OR $20 in receipts for a $10 gift card. Go check out their website and see how you can get involved! Here is another quick side to help use up all the summer produce! Fresh corn, zucchini and basil. This can be ready in a matter of minutes and this might be my favorite way to cook zucchini. It is barely tender- with a nice crisp bite and so delicious. Fast, fresh and really tasty. I couldn't ask for anything more. Have you tried Amaranth? It's not a grain, it's a seed. Kind of like quinoa, but smaller. Here is a little bit more information about it, as well as some pictures. Anyway, a couple of months ago I tried it at a class where we learned about different grains and seeds to serve. My girls loved it, so I bought some in bulk at EarthFare the next time we went. minutes using 2.5 cups water for every 1 cup of amaranth. 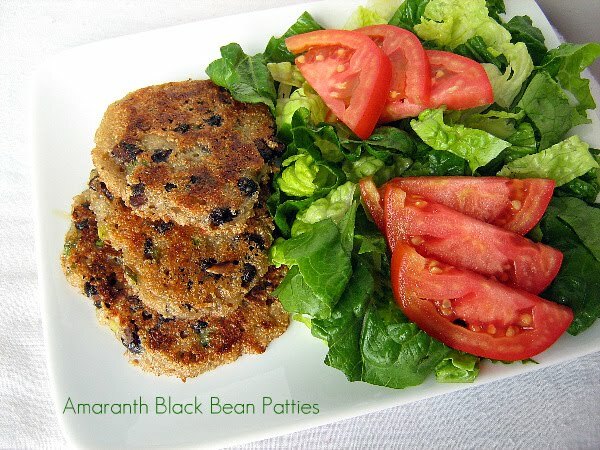 That is the method I used and it was a little bit too moist for these black bean patties, but it worked out. The mixture turned out more like batter, so I ended up scooping it onto my griddle and cooking them that way. It worked. And they were really good. I served them alongside some romaine and fresh tomatoes. The leftovers were good cold, right out of the fridge. We have also enjoyed amaranth as a hot cereal option in the morning. I love it when a food can be breakfast, lunch or dinner! My husband asked "is there any more of that?" I finally got around to it a couple of weeks ago and they were fantastic! I love making pancakes, muffins & waffles with whole grains and the fact that these have a double dose of oatmeal in them made me very happy. You grind up some oats in the food processor to make oat flour and also use cooked oatmeal in the batter. I used skim milk because that is what I usually have on hand unless I am making pastry cream or ice cream. My kids loved these. I like having leftover pancakes and waffles, so that I can freeze them for another day. This time they were all eaten. Some at breakfast and some for snacks later in the day. They really had great texture and flavor. Winners! We don't eat much corn except for in the summer time. I prefer having it fresh, from a local source and so during the summer we get to enjoy it almost weekly. 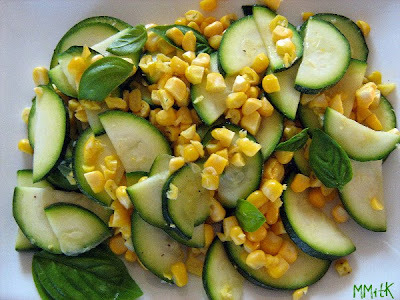 My kids love it just straight off the cob or cooked for a few minutes and I have been cutting it off the cob, fresh, and adding it to all sorts of salads and other dishes. 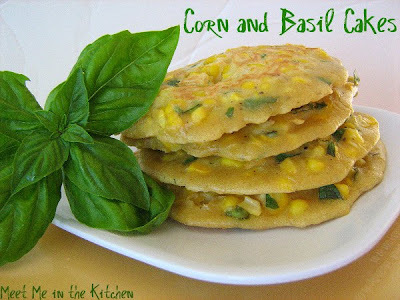 My basil plant has also been producing tons of beautiful leaves, so when I saw this recipe in Eating Well magazine for Corn and Basil Cakes, I thought it looked like a fun way to use both corn and basil. 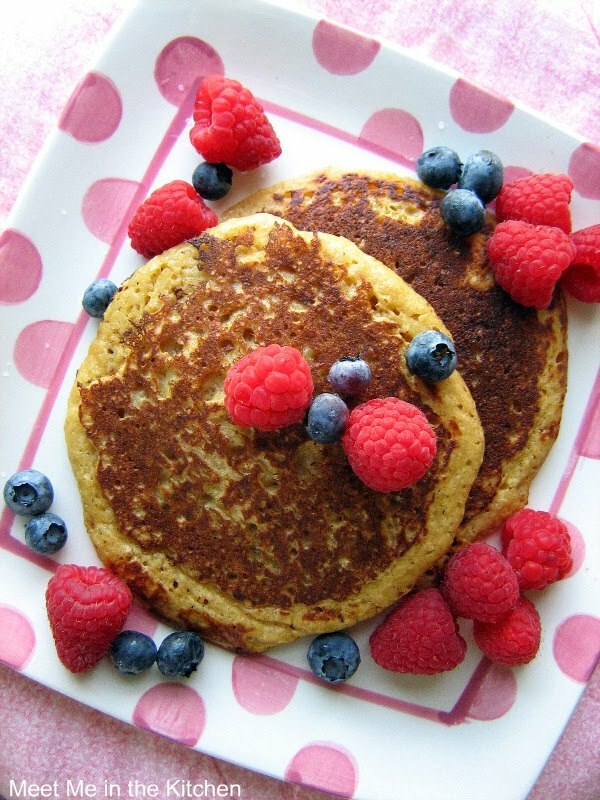 I wasn't expecting these corn cakes to be a hit here, simply because my family prefers pancakes to be covered in berries, not corn. I really didn't have high hopes, but my family proved me wrong. My kids all loved them and wanted more. My husband even thought they were delicious. So, I was happily surprised. Go ahead and see for yourself! My kids started school today, so I thought it was a great time to post some breakfast recipes and ideas. 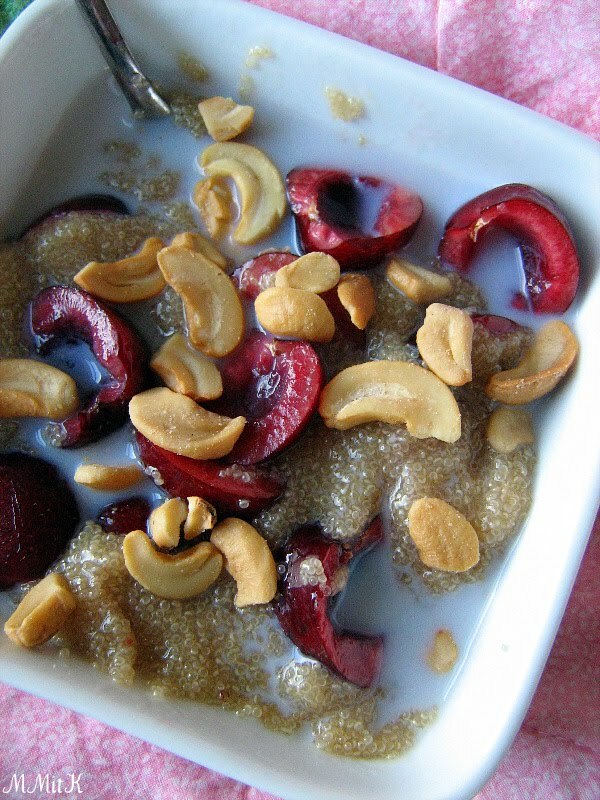 Over the summer I have gotten my children to stop eating cold cereal- mostly because I don't think it is healthy enough or hearty enough for a good start to their day. Here are some of the things we have been eating instead. 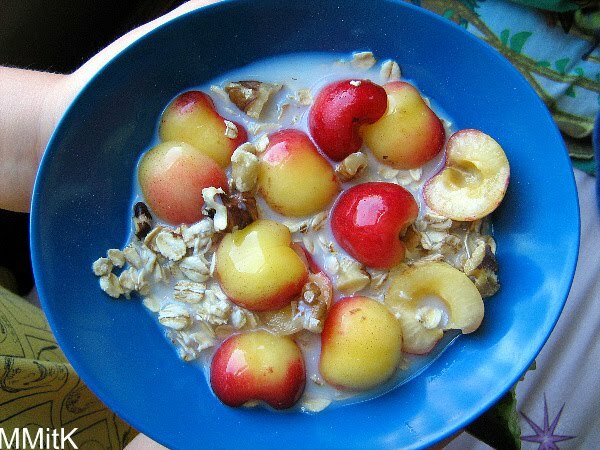 Muesli- (pictured above with rainier cherries & walnuts)- This is something my mom always made for us with whatever fresh fruit we had. You just put raw oats in a bowl, add milk, fresh fruit, and nuts. Then eat it. You can let it soak for a couple of minutes to soften the oats, but we like to eat it right away. Smoothies- I keep frozen banana slices in the freezer and then add blueberries, strawberries, peaches or whatever fruit we have & a little milk. 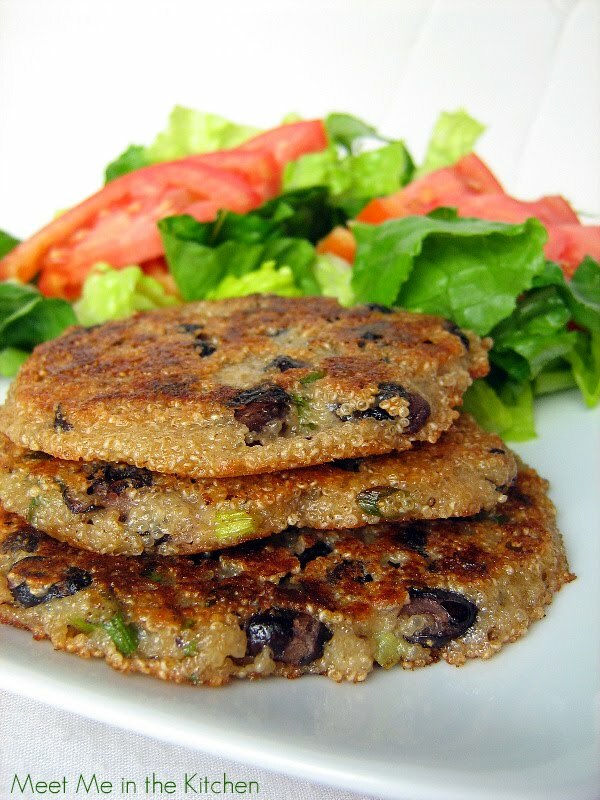 You can also add flaxseed meal, nut butter, or a handful of spinach to up the nutrition level. For other breakfast ideas check out the Breakfast recipes I have posted in the past. This morning I made Quick Cinnamon Biscuits for the first day of school as a special treat, using about 1 cup of half & half instead of the heavy cream. I'm thinking of making a schedule for school days, so I know exactly what I am making for breakfast each day. For example- Monday- hot cereal w/ fruit & nuts, Tuesday-egg based breakfast, Wednesday-smoothie or yogurt/fruit, egg or toast on the side, Thursday- muffins, pancakes or waffles, Friday- hot cereal. What is your favorite go-to breakfast? 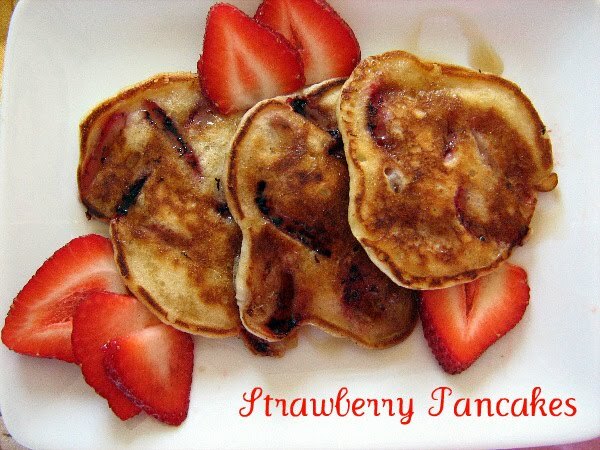 What other breakfast ideas do you have? Today is the last day to enter my giveaway, so head over& comment to get some free stuff! This is a horrible picture of a wonderfully delicious cake that got rave reviews. My mother-in-law asked me to make a couple of treats for her work party that could be made ahead of time. 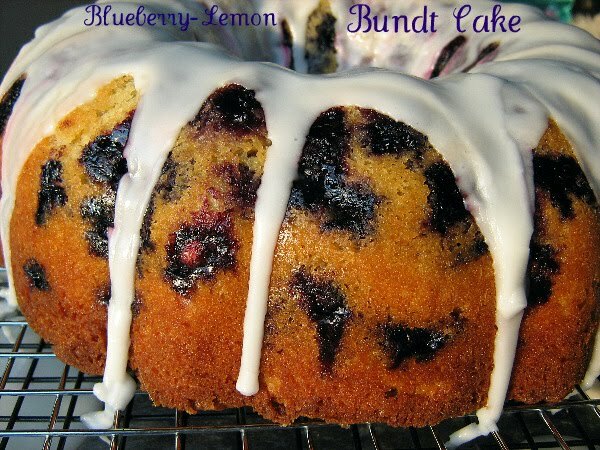 I was thinking summer flavors and this blueberry lemon combination won over all the other ideas. I made it the night before, glazed it, and then she kept it covered until the next night. Bundt cakes usually do well when they sit overnight, so I took my chances and it worked with this cake. I only had 1/2 cup of sour cream in my fridge, so I used 1/2 cup of low-fat buttermilk to make the full cup of dairy for this cake. I also used a glaze of fresh lemon juice and powdered sugar that was shown when this cake was made in the video included with the recipe. I also used more lemon zest than it called for because sometimes I get carried away with my zesting. I wish I would have gotten a better picture of this cake since it was such a hit. Everyone requested the recipe- I wish I could have tried a slice! Don't forget to enter the giveaway I posted yesterday! 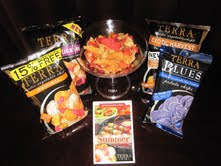 Recently, I was contacted and offered a chance to sample some of the new TERRA Chips flavors. I received the TERRA Chips in the mail yesterday and now I am going to be able to giveaway the prize package shown above. The prize is valued at $25 and includes four bags of TERRA Chips, a martini glass inspired serving bowl and a Summer Entertaining Guide. Terra a la Mexicana – The latest addition to the Terra Exotic Mix line-up is this classic mix of vegetable chips seasoned with a piquant blend of tomato, black bean and roasted garlic flavors. Terra Original - Terra Original is made up of the classic mix of Taro, Sweet Potato, Yuca, Batata, Parsnip, and Ruby Taro. Terra Blues - Packed with flavor, Terra Blues are flavorful yet but with 40 percent less fat than the leading brand of potato chips and are made with naturally blue potatoes. A vibrant bluish-purple in color with a slightly nutty flavor, these Terra Blues® Potato Chips are deliciously different and the Official Snack of JetBlue Airways®. Terra Exotic Harvest with Sea Salt - This earthy exotic harvest features a medley of flavorful blue potato, sweet carrots and japanese kabocha squash.
" They are chewy and delicious. I love 'em." "so crunchy", "they have a yummy texture". My son liked the Terra a la Mexicana best. One of my daughters loved the blue potato chips and all three especially liked the carrot chips. We don't eat a lot of chips, so it was fun to taste the different flavors of all the chips. I hope to try the recipe included in the entertaining guide where you coat tilapia in crushed chips. I think it will be delicious! To win the Fire Up the Flavor prize pack, leave a comment on this post, letting me know your favorite TERRA Chips variety, your favorite recipe or pairing from the online guide or how you plan to use the TERRA prize pack. The giveaway will close Thursday, August 5th @ midnight EST. I will announce the winner on Friday. Be sure to leave a way for me to contact you in your comment! The TERRA Chips online entertaining guide provides summer entertaining tips, pairings and nine mouth-watering recipes (Blissful Bruschetta, Spicy Fish & Chips a la TERRA, etc.). Separately the “Fire Up the Flavor” online sweepstakes, running through August 31st, features 25 grand prizes (charcoal grill, serving bowl, $250 grocery gift card, 12 bags of TERRA Chips and a printed entertaining guide) and 50 first prizes (six serving bowls, an array of TERRA Chips and a printed entertaining guide). Details on both are located at www.terrachips.com. When I was up visiting my sister a couple weeks ago in DC, she made the most delicious stir-fry where she roasted the eggplant before mixing it with the other vegetables. 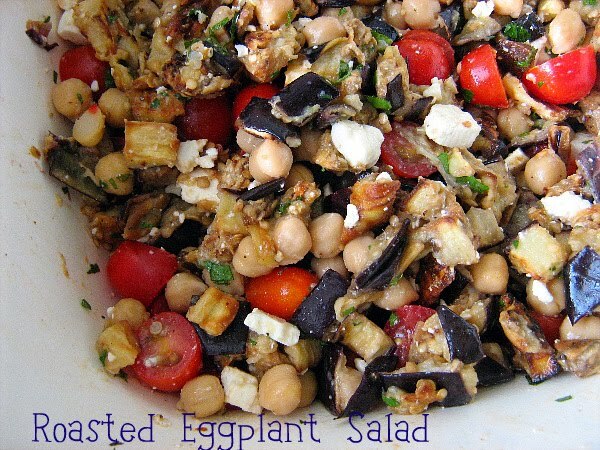 The marinade she used on the eggplant was so delicious. I was hoping I could recreate it somehow. I found a couple of beautiful baby eggplants recently and wanted to roast them. I found a recipe that was pretty close to the marinade- I just added a couple Tbls of soy sauce. The eggplant is good enough to eat right off the baking sheet, but I did make sure that some of it ended up on top of quinoa, where is was joined by some blanched broccoli. I didn't have any sesame seeds, so those were left off, but this was still very tasty.